While some factions of society continue their life mission to rid the world of absolute power, the 2011 Bentley Mulsanne does the opposite. It harnesses near-absolute power in the form of a big, low-revving V-8 engine, swaths of wood and leather and real chrome, and elegant proportions, staking its claim as one of the finest four-doors on the planet. 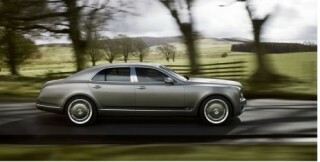 According to Bentley executives, the 2011 Mulsanne is "a big, heavy car, and unashamedly so." And yet it's slightly understated. It isn't flashy--it's just big, and exceptionally well-crafted. The engine is a 6.75-liter V-8 engine, which drives the rear wheels through a ZF eight-speed automatic transmission. That engine puts out 505 horsepower, and an intensely powerful 752 pound-feet of torque at a very low 1750 rpm. Its redline, in fact, is a mere 4500 rpm. When pushed, the engine noise is a muted roar, and the Mulsanne gathers speed swiftly but almost discreetly. It will do 0 to 60 mph in 5.1 seconds, 0-to-100-mph in less than 12 seconds, and the top speed is rated at 184 mph. With the closest competition coming in the form of the Rolls-Royce Phanton, the Mulsanne is appropriately sized--and priced, at $285,000 before a $2600 delivery fee and a tour through the vast customization options, which include a choice among nine wood trims, along with leather colors, paint colors, additional aluminum and chrome pieces, and optional fitments like tray tables. Each Mulsanne interior wears the equivalent of 18 cow hides, once they're tanned and matched carefully. Details matter inside the Mulsanne. Take the iPod integration: designers fashioned a flat, leather-lined drawer that glides out of the dash. Once connected, the iPod door can be shut and the device banished from view, replaced by a more visually soothing view of fine wood. TheCarConnection focuses on reviewing mass-market vehicles. Our sister site MotorAuthority covers the world of luxury and performance vehicles--and they've filed this first drive of the 2011 Bentley Mulsanne. Our numeric ratings here are based on their driving impressions. Looking for a different year of the Bentley Mulsanne?